Wait–Did Anti-ICE Ocasio-Cortez Imply That She Wants Jeff Sessions To Be More Involved In Immigration Policy? "Every day that we allow the continued violation of those children's rights is the day that I believe the moral character of the United States is at stake," Ocasio-Cortez said. The politician said Americans who want to see ICE abolished have to "have a rapid response." "We have to occupy all of it," she said. "We need to occupy every airport. We need to occupy every border. We need to occupy every ICE office until those kids are back with their parents, period." First of all, ICE is not [U.S. Customs and Border Protection,]" she said. "When we talk about abolishing ICE, we're talking about ending family detention. We're talking about ending an agency and ending a practice and a structure that is not accountable to the U.S. Department of Justice, that often takes on things that look a lot like enforcement activities," she said. "So to have an enforcement agency that operates outside of the accountability of the Department of Justice, it's no surprise to see the violations of civil and human rights that we're seeing right now." Ocasio-Cortez said that the movement to abolish ICE also represents "an implicit rejection of the current administration's policies," including its family separation policy. Wait—so Ocasio-Cortez wants to involve Attorney General Jeff Sessions, who made his name being a hardliner on immigration in the U.S. Senate, more on this subject? It appears that way, as evidence by her Twitter thread on ICE in May, where she said the now-defunct Immigration and Nationalization Services used to forward crimes to the DOJ, which should be done now. Folks are also talking about how this isn’t just Trump. Like warrantless wiretapping, the extrajudicial and unaccountable nature of ICE is essentially built as a maiden in waiting for authoritarian abuse of power. In fact, the folks who panic about the idea of #abolishICE seem to forget that we had a system before it: the INS. The INS forwarded crimes to the Department of Justice. That is exactly how it should be done. Families do not all come to the US because they spontaneously “feel like it.” They also come because of global trade deals that destabilize local economies, or military interventionism, or regime changes at home. 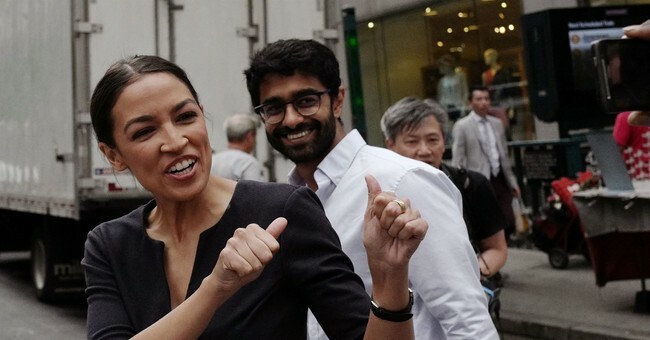 …During a Friday interview on PBS' "Firing Line" Friday, Ocasio-Cortez gave a more nuanced answer when asked her views on the Jewish state. "Well, I believe absolutely in Israel’s right to exist. I am a proponent of a two-state solution. And for me, it’s not — this is not a referendum on the state of Israel," she said. First, people working multiple jobs has no distorting effect on the unemployment rate, which is calculated by taking the number of unemployed people and dividing it by the number of people in the labor force. The raw number of jobs being worked by Americans has no bearing on these numbers. Second, everyone does not have two jobs. As Bloomberg View's Noah Smith points out, only about 5 percent of workers are moonlighting. This rate has actually dropped slightly over the last three decades. Ocasio-Cortez continued: "Unemployment is low because people are working 60, 70, 80 hours a week, and can barely feed their kids." Again, the number of overtime hours Americans are working has no impact on the unemployment rate. CNN’s Chris Cillizza noted that perhaps the Democrats should “slow their roll” on pushing the Cortez stock…because it’s awfully shoddy, as it is with all socialist projects. Still, the notion that she wants the DOJ to be more involved in immigration policy with Sessions at the helm is just interesting. Did she inadvertently step on the rake again? Maybe.